We're taking our products and services to the next level to continue our journey to help our clients grow online. We've got some exciting ideas and a brilliant team we've put together and we'd like you to join us. With the partners we have lined up to work with, we'll be achieving even more great opportunities in the UK and beyond as we take on our cause to help event and conference organisers ticket their events fairly. Customers don't need to be ripped off along the way and, as has been seen in recent times, there is no need to leave fans or artists being over charged or without tickets when they want to sell on their unwanted tickets with secondary sales. 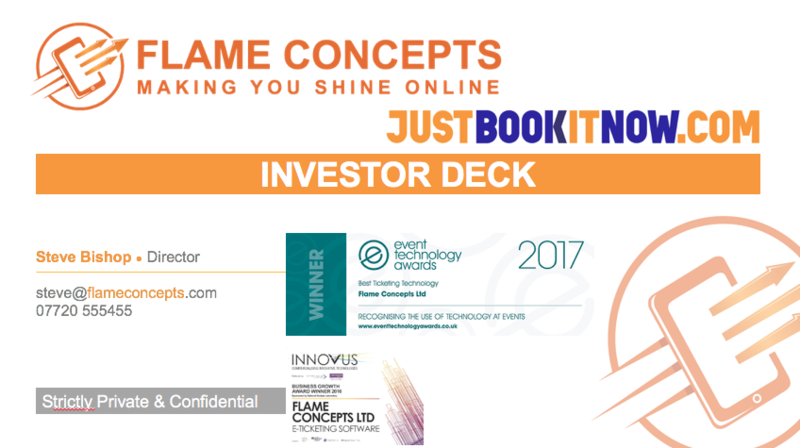 The investment opportunity with Flame Concepts is one that will help a traditional market reshape the future. We're already making great strides being profitable and multi-award-winning and finding a mix of clients and events to work with around the UK and into Europe. We've built a board with the skills to support international development and growth, strategy and team development alongside the software and finance skills. We are potentially looking at a cornerstone/lead investor and crowdfund the remainder if not a consortuim or main investor to provide the full investment raise. We've got the full details, facts and figures, targets and plans all ready and would welcome the opportunity to discuss your involvement and support in investing in Flame Concepts. Take a look at our details on the Angel Investment Network and get in touch to discuss how you can join in the next revolution in ticketing. We're not another ticketing company, we're about to go global with our partners and it'll be great if you're with us to make the most of the investment opportunity. We are already EIS registered.